The actors packed up long ago. The cameras and props are no doubt in storage. But I believe the setting for “It’s a Wonderful Life” remains intact. Many believe that Seneca Falls, N.Y., is the inspirational backdrop for Bedford Falls. That iconic movie is now celebrating its 65th anniversary. As I walked the streets of Seneca Falls with my family one Christmas evening, I was convinced it was as well. 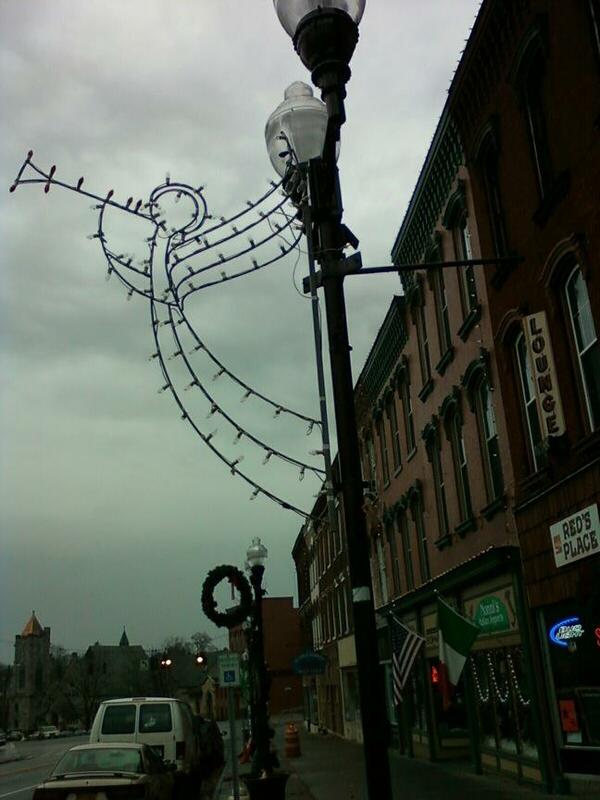 Amid a gentle snowfall, angels playing trumpets light up the village’s main street. Streets named “Bedford Falls Blvd.” and “George Bailey Lane” reinforce the connection to the movie. Another indicator that George Bailey and his guardian angel, Clarence Odbody (played by Henry Travers), might be just around the corner is the village’s steel truss bridge over the canal. We took this road trip – about an hour from our home – to stroll along the streets that we believe Jimmy Stewart (George) ran down in the movie. We stopped on that bridge and looked over the icy-cold water below. There, it’s easy to feel Stewart’s/Bailey’s anguish about wanting to end his pain. George, who had always put everyone else first, now feels the world would be better off without him. It’s Christmas Eve, and it’s up to Clarence to change George’s mind. If he succeeds, Clarence will earn his wings. Clarence’s plan is to show George what life would be like if he’d never been born. George comes to realize that, despite some bad turns in life, there really is much to enjoy. The movie’s message – since it first came out in 1946 – is that we just need to stop and consider what we really value. For George, it was his family and friends. What a wonderful legacy for a community to have. While some dispute that Frank Capra had Seneca Falls on his mind when he made this movie, there are some amazing coincidences. The script mentions Rochester, Buffalo and Elmira. They are close to this village which was – like Bedford Falls – a mill town back in 1945 when this movie was shot. There’s one other intriguing note. On that bridge that I stood on, there “was a plaque honoring Seneca Falls resident Antonio Varacalli, who had leaped into the icy waters of the canal in April 1917 to rescue a girl who had just attempted suicide by jumping off the bridge. Varacalli saved her but was overcome by fatigue from the rescue and drowned,” according to The Real Bedford Falls website. That’s not a huge leap for a director to make from one heroic gesture to George jumping in to save Clarence, who pretends to be drowning. Whether or not Capra did, we felt like we were part of movie history when we were in Seneca Falls. That night, we felt that Jimmy Stewart and Clarence were there with us. Maybe it was just wishful thinking, but I’m sure it was him who shouted “Merry Christmas” as he ran by. Your wonderful writing made for wonderful reading, Judy. I’ve long and often heard of a Seneca Falls/Bedford Falls connection. You make an interestingly detailed and convincing case for it. Nice to see the accompanying photo by my dear friend Margaret McCormick too. Thanks for your comment, John. Seneca Falls is a beautiful community and it seems like it’d be a natural fit for the movie – so many coincidences between it and Bedford Falls. I definitely felt like I was transported back into the movie when we visited Seneca Falls. It felt and looked just like the movie. Thanks for sharing. I had considered using the photo of you and Keith on the bridge. Not sure it would have copied well from a photo. We did have a great time that night. I never did make it to Seneca Falls, but your “evidence” does seem strikingly true to the movie. This is a very interesting post about one of the best American films ever made. Thanks, Judy! Thanks for writing. We made the trip to Seneca Falls on a Christmas evening so the darkness only added to the movie “magic” we felt. Hmmm…Seneca Falls…will have to do a road trip some day…all the way from Seattle. Am a huge fan of “it’s A Wonderful Life.” On that film, hubby and I agree. My favorite movie ever…I drive my kids nuts by watching it 5 times a Christmas 🙂 I came to visit via Hugmamma, glad I did!! Happy New Year! Glad you love the movie. I do, too. Can’t say I’ve watched it 5 times in a season, but I’ve seen it many times. Thanks for stopping by and commenting. I appreciate Hugmamma sending you my way. Visiting due to hugmamma’s suggestion..I am glad I did! Thank you for the info..
You’re welcome. The movie, “It’s a Wonderful Life,” seems timeless. Difficult to believe it’s been around 65 years. Thanks for stopping by and commenting. Give Hugmamma a big “hello” from me.